While smart folks over at NARA are thinking about the preservation strategy for digitized 2010 census forms, I got inspired to take a look at what we have preserved from past censuses. In specific, I wanted to look at posters, photos and videos that give us a glimpse into how we encouraged and documented the activity of participation in the past. 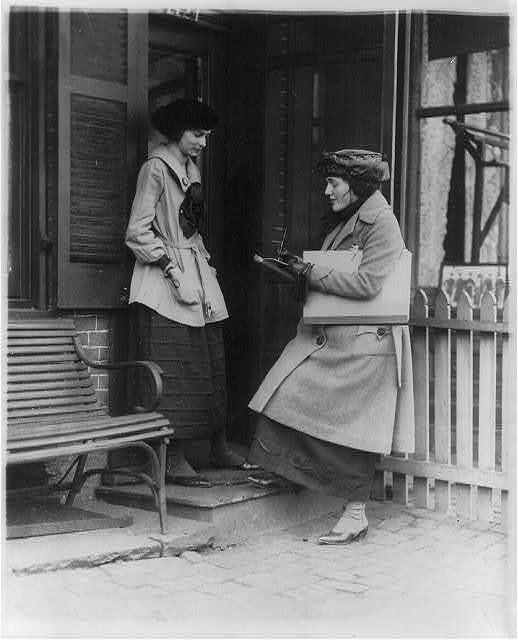 There is a dedicated Census History area on the Census website, as well as a section of the 2010 website called The Big Count Archive. 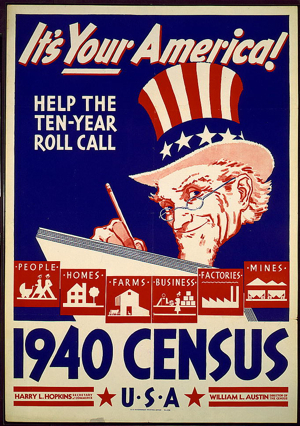 While I like the wide range of 2010 Census Posters – the 1940 census poster shown here (thank you Library of Congress) is just so striking. I also loved the videos I found, especially when I realized that they were all available on YouTube – uploaded by a user named JasonGCensus. I am not clear on the relationship between JasonGCensus and the official U.S. Census Bureau’s Channel (which seems focused on 2010 Census content), but there are some real gems posted there. For the 1960 census, a PSA explains the new FOSDIC technology which removed the need for punch-cards. With the tagline ‘Operation Rollcall, USA’, the ad presents our part in “this enterprise” as cooperation with the enumerators. In the 1980 PSA the tag line is ‘Answer the Census: We’re counting on you!’ and stresses that it is kept confidential and is used to provide services to communities. By the time you get to the 1990 and 2000 PSAs we see more stress on the benefits to communities that fill out the census and less stress on how the census is actually recorded. Exploring the area of Census.gov dedicated to the 2010 census made me wonder what was available online for the 2000 census. Wayback Machine to the rescue! They have what appears to be a fairly deep crawl of the 2000 Census.gov site dating from March of 2000. For example – the posters section seems to include all the images and PDFs of the originals. I even found functional Quicktime videos in the Video Zone, like this one: How America Knows What America Needs. The ten year interval makes for a nice way to get a sense of the country from the PR perspective. What did the Census Bureau think was the right way to appeal to the American public? Were we more intrigued by the latest technology or worried about our privacy? Did they need to communicate what the census is used for? Or was it okay to simply express it as an American’s duty? I appreciate the ease with which I can find and share the resources above. Great fun. And for those of you in the United States, please consider this my personal encouragement to fill out your census forms! Update: The WashingtonPost has an interesting article about the ‘Snapshot of America’ series of promotional videos for the 2010 census. Definitely an interesting contrast to the videos I reviewed for this post. What is wrong with our government when they spend huge amounts of tax dollars sending out a letter to millions of Americans telling us to expect another letter in a week as part of the US Census? See the letter, if you didn’t get one yet, and read about it at http://www.realvaluesite.com/?p=229. What can we Americans do about stopping this horrific waste of our tax dollars? Penny-I agree 100%. A letter to inform us that another letter is coming is quite antiquated these days. My wife and I filled out our forms and mailed them back, but I’m sure a number of our friends did not (necessitating the door to door version of the Census that pays WAY more than they should!). I have to wonder if they couldn’t have included a spot on that first letter for an email address, or if there is some other way to collect them (Postal carrier perhaps) to help fill in the gaps of traditional mail and 21st century America. It’s no easy task, but that doesn’t mean you shouldn’t try! I agree completely with Penny on this subject. No matter what we as citizens try to do the united states government claiming that they are listening and “helping the matter” rule the power of our choice. They over rule us. Spellbound Blog examines topics at the intersection of archives and technology. The postings on this site are my own and do not necessarily reflect the opinions and positions of the World Bank Group. Copyright © 2019 Spellbound Blog – Powered by Customify.